Schooling races for 2-year-olds continue Friday at Louisiana Downs for remaining hopefuls to the $250,000-est. Harrah's Entertainment Futurity. BOSSIER CITY, LA—FEBRUARY 6, 2019—Louisiana Downs will host their second set of training races for 2-year-olds this season on Friday. The track will card eight races for 2-year-olds who remain eligible for the $250,000-est. Harrah's Entertainment Futurity. First post for the 220 yard races is set for 11:00 a.m. at the Bossier City racetrack. 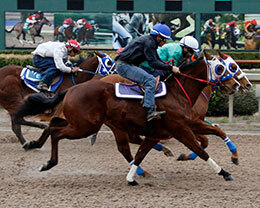 Trials for the grade 3 event will be contested on March 3 and the finals are scheduled for closing day of the 2019 Quarter Horse meet March 21. Among the 41 hopefuls are a number of 2018 summer sale graduates from Texas, Oklahoma and Louisiana. AQHA Racing Champion trainer Kennth Roberts Sr. will saddled $23,000 TQHA Sale repurchase Locomotive. The son of multiple grade 1 sire Freighttrain B from the grade e winning and multiple graded stakes producer Shescheckinumout, by Check Him Out, for owner/breeder Bobby D. Cox. This is the family of Grade 1 winner and grade 1 sire Favorite Cartel. Race 4 will feature $20,000 Heritage Place Yearling Sale repurchase La Jolla Return, a filly by one of last year's leading second crop sire High Rate Of Return from the Sweet First Down mare Rc Sweet Racee, a sister to G3 winner I Am That Hero. Trainer Arturo Davilla II will saddle the filly for owner Arturo Ibarra. Roberts will saddle Bobby Cox homebred Bravisima in Race 6. John Hamilton has been tapped to ride the $20,500 TQHA repurchase by Captain Courage from the stakes-place Runaway Winner mare Runaway Dee Dee. Bravisima is a half-sister to four black type including Grade 3 winner A Down Right Runaway. In closing Race 8, owner-trainer Hector Alcala will saddle $26,500 Heritage Place Yearling Sale graduate. Modesto Pina will ride the Freightrain B colt out of grade 2-placed Azoomin With Jessie by Azoom. Treno is a half-brother to stakes winner Azoomin Jamie and stakes-placed Miromar. Jumonville Farms has joined StallioneSearch.com again this year to provide a program of Friday's 14 training races, including sires, dams, owners, trainers, jockeys and sale data (where applicable). Copies will be made available at Louisiana Downs on Friday or CLICK HERE to download a printable PDF version. According to track officials, there will be no live streaming of Friday's schooling races at Louisiana Downs . Training race results, with times for all starters, will be posted on StallioneSearch.com as soon as they become available from the racetrack on Friday.